Antarctic annual sea-ice extent is projected to decrease by 25 per cent by 2100, and this will bring easier access to the Antarctic continent by ship. This is likely to affect not only research, which is a main activity in a continent designated as a “natural reserve devoted to peace and science”, but also commercial activities, such as tourism. Tourism activities are expanding tremendously with the number of shipborne tourists increasing by 430 per cent in 14 years and land-based tourists by 757 per cent in 10 years. 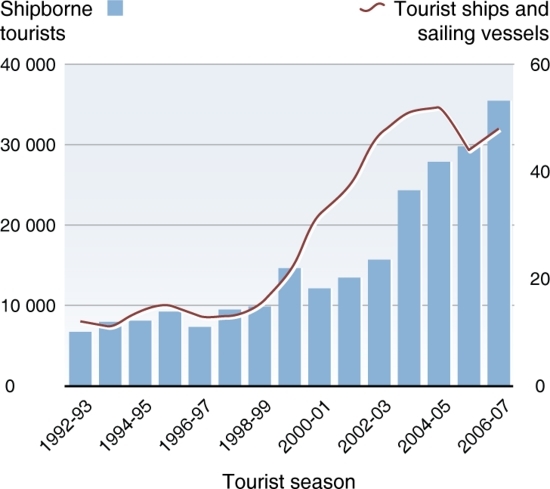 The majority of the seaborne voyages are to the Antarctic Peninsula region where the open sea condition in the summer season makes those voyages feasible and safer. 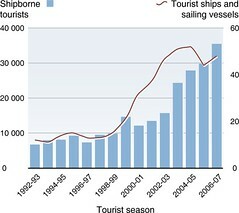 Parallel to the growth in tourism is a substantial increase in tour ism vessels, some with large passenger capacities and without ice-strengthened hulls, such as the Golden Princess which has a capacity of 3700 persons, exceeding the estimated peak in personnel based in all Antarctic stations.